In an effort to understand fully what I'm trying to do with this blog in terms of content, I've listed below the topics posted on thus far. This examination of the content here ties to my last "Why & How Thus Far" post and I have to agree with my assessment there (well, I would hope so)... I'm happy thus far. The overriding goal of the blog is to write about stuff I find interesting and I feel I'm doing that. This post will have a decidedly different bent than prior ones, but there's some things that will be a benefit for myself as the author (and perhaps others as readers). There's a three-part topic to cover with the first two thirds discussed here and the final third in a subsequent post. like to write stuff: I genuinely enjoy writing. This isn't a new thing, but something that in the last 6 months or so, I've actually begun exercising again (really for the first consistent time since college). I'm not sure what form exactly it would take, but would like to work in a career where writing is a significant output of what I do. A bread crumb trail towards the three Rs: reading, writing & really trying to learn new stuff. This header statement is a pretty good description of what I hope the output from this blog to be. The goal is to bring together my writing along with what I read... whether that be from magazines, books or websites (or expanding the universe further, things I view or experience). To state it simply, I hope to tie together in one place things I've found to be... interesting (hmmm... this last statement could have been taken directly from the "wherefore the blog" section). As this has been written, I recognize that there really is another goal behind the blog. Reference was made earlier to my desire to work in a career that involved me writing... hopefully, this blog can be a vehicle to help accomplish that goal. (2) The path to current point... this can best be summarized by pulling (in list form) some of the verbiage currently in the "transmogrification of the blog" section. A. For several years now, I've been a "read and rip out" kind of guy. I'd come across various things I find interesting (mostly magazine articles) and rip out and save the page(s). B. I created this blog back in mid 2006 and began posting here links to the articles I ripped out along with associated websites from said articles. This was simply in list form w/o much verbiage around what was contained within. C. Sometime from mid 2006 to mid 2007, I added to the blog lists of both books that I've read (many of which I learned about through the aforementioned magazine articles) over the last few years and websites I've found interesting (yep, many from the same articles). D. In March of this year I created and began writing http://ahockeyguy.blogspot.com/. Designed to be completely different than this blog in both content and approach, it's about the NHL (and my beloved San Jose Sharks) and contains mostly my original writing and very few website/magazine article/book links. E. In July of this year I realized I wanted to bring together in this blog my writing with the notes I've taken and things I've come across (non-hockey related) that I've found to be interesting. Since that time, I've posted close to daily (32 posts in close to two months) and have tried to stay true to the goal set out... to write about things I found interesting. (3) The path going forward... I've reached the point where I'm happy with the content I've been putting onto the blog which takes me to the next step... how to get a readership. In a May 2008 special report (which was also it's cover story), BusinessWeek published a series of articles on customer service. It's an interesting and all-encompassing look at what consumers are getting from corporations, and how they're demanding more. - "Rebel with a Stalled Cause" about the customer advocacy website http://www.gethuman.com/ which has had a mixed record of success, but still provides an interesting service... the ability to look up phone #s and the menu prompts to select to get a live customer service rep at thousands of different companies. _ "Trader Joe's Recipe for Success" about how the supermarket thrives through a mixture including excellent employees and niche product stocking. - BusinessWeek ranking of companies on their 50 Customer Service Champs list. The top 5 according to BW are: (5) Trader Joe's, (4) Lexus, (3) Fairmont Hotels, (2) L.L. Bean & (1) USAA. This special report reminded me of how in Jan 2006, BW published an interesting article titled "Would you Recommend Us?". It was about the fairly new concept of measuring customer sat using the concept of "net promoter scores" (or NPS) which are derived through asking customers to rate on a 1-10 scale how likely they would be to recommend that company to friends and/or colleagues. It's an interesting idea in that it seems to to both get to the heart of how a consumer feels about a brand and also ties into a concept from the BW special report... how in today's "information society", the consumer has many new ways to tell their experiences (good or bad) with brands. In "A Sense of the World", a narrative nonfiction account of blind traveler James Holman, author Jason Roberts provides a fascinating look at this adventurer. I first heard about Roberts' book in the Time Magazine review titled "Have Cane, Will Travel" by Lev Grossman and was definitely not disappointed after actually reading the book. Tracing Holman's life from his birth to death is an interesting read and Roberts does a very compelling job of describing the travails and challenges faced from the explorer, James Holman. Definitely recommend this book... particularly for those who love adventurous travel, or at least the idea of such. After pining for one since first hearing word of it's release, I picked up my new 3G iPhone last week (As this photo essay from Time Magazine shows, I certainly wasn't the only one). While it has received some criticism in the press (mostly for trouble with phone reception), I'm thrilled to now have it. After being asked why I made the purchase, I realized that the cause is probably split equally between the iPhone's features and what it represents. The features themselves are pretty well documented... phone, e-mail, web browsing, access to the application store; basically a small personal computer that can make and receive calls. Everything for the most part appears to work well (though I do find odd both that the typing screen can't be rotated 90 degrees to make the keys larger and that the phone texting function can't receive attachments), but what the iPhone represents is a story in and of itself. 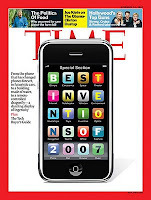 A Nov 2007 issue of Time put the original iPhone on the cover (shown below) and in the contained "Invention of the Year" story, details it's leap forward in the areas of both design and user interface. Additionally, though, the iPhone is hyped (in a good way) both for it's being a platform rather than just a phone and it's likelihood to shape technology going forward. This shaping would be from other manufacturers designing to keep up and Apple itself introducing new and better generations of the iPhone... which it has of course already begun to do with the 3G intro. So, while I don't consider myself to be much of a technology early adopter (to use a business lexicon phrase), I'm excited to now own this thing. The functionality is there and maybe just as meaningful, so is the promise of things to come in consumer technology. Very cool stuff. "Home Thoughts" from the August 25, 2008 issue of Time Magazine chronicles a prefab home exhibition currently showing at the New York Museum of Modern Art. This same exhibition was also detailed in a recent BusinessWeek article and made me think of some other interesting mentions I've seen over the last few years of prefab homes. 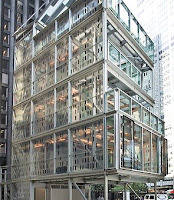 Back to 2005, this BusinessWeek story shows seven different prefab homes and for several years now, I've seen recurring mentions of designer Michelle Kaufmann and her "Glidehouse" prefab home. Kaufmann seems to be the rockstar designer for this new movement of sustainably built prefab homes and the below You Tube video can also be found along with several others at this link on Kaufmann's website. Prefab homes... affordable, sustainable and very cool. The first "official" (non-list) post to this blog was about Chris Jones who writes (I believe) primarily for Esquire Magazine. Titled "Out of Orbit (or "Too Far From Home") & other writings by Chris Jones, the post is about his book ("Too Far From Home" in hardcover / "Out of Orbit" in paperback) chronicling the astronauts and cosmonauts who were on the International Space Station at the time of the Challenger disaster. Additionally, it has mention of the poignant story "The Things That Carried Him" from Esquire. - "The Runaway" from Dec 2004 about Ricky Williams and his less than excited return to the life of an NFL player. Very insightful look at the choices a star football player has to make between the sport they play and the league they have to play it in. - "Barry Zito is Lights Out" from June 2007 about the newly signed (to a $126M contract) San Francisco Giant pitcher. Similar to the Williams piece, it shows a fascinating look at an individual whose vocation places them squarely in the public eye. - "Into the Void" from Feb 2007 about Chris Snow, Minnesota Wild Director of Hockey Operations. Snow took this role at 25 after previously being employed as a Red Sox beat writer by the Boston Globe. The particulars of this story are amazing in and of themselves and Jones as always does a great job of fleshing out the details. - "One of Us" written in three installments from August 2006 through March 2008 about the presumptive 2008 Republican Presidential candidate, John McCain. It's a very detailed and intimate look at a one of the two remaining major party challengers to lead the country through the next four years. From the Esquire Magazine website, writer Daniel Murphy in the "Blog of Lists" provides his "Five Most Chill-Inducing Olympic Moments" with accompanying You Tube videos. The list starts off incredibly strong with British track star Derek Redmond being helped across the finish line by his father (video of which has now been made famous by Visa and a Morgan Freeman voiceover) and goes on to cover moments featuring the 1980 US Olympic Hockey Team and gymnast Kerri Strug vaulting her way to a team gold on one good leg. The Redmond You Tube post is below and the other four "chill-inducing moments" can be found at the link to Murphy's post above. Time Magazine writer Joe Klein may be best known for being the "Anonymous" author of "Primary Colors" (a fictionalized account of Bill Clinton's run for the Presidency), but that's by no means all that Klein has written of value. 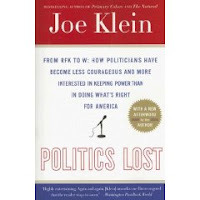 Klein's book "Politics Lost" is a fascinating look at his view of some of the problems in the American political process. To this end, the sub-title of the book "From RFK to W: How Politicians Have Become Less Courageous and More Interested in Keeping Power than in Doing What's Right for America" offers a good preview of his feelings on many elected officials... and the political consultants and handlers who shape those officials. One thing of particular interest in the book is Klein's mention of Robert F Kennedy's speech (overviewed and available in this NPR story) the night of Martin Luther King Jr's assassination. Kennedy's unrehearsed (and now famous) speech to a largely black crowd on this extemely emotional and volitile night is held up by Klein as an example of the best that political leaders can and should offer the public. While Klein has garnered a good amount of attention for his books, he is also well know for his frequent commentaries (named after the famous "Man in the Arena" quote from Theodore Roosevelt) in Time Magazine. Several of Klein's commentaries that I've found to be of note are those on Merle Haggard returning to the Democratic Party, Tim Russert and his relationship with Klein and Barack Obama's Cabinet choices should he become President. That said, Klein has a breadth of excellent writing and his "In the Arena" work can be found at this compilation list. Never would I be a Michael Vick apologist, but Lester Munson's "Bad advice, bad decisions: the loss of Michael Vick's fortune" piece on ESPN.com tells a remarkable tale of one advisor (mostly financial) after another seeming to line up for a (larger than deserved) piece of Vick's money. Reading a story like this demonstrates why exactly the NFL holds a mandatory multiple day rookie orientation to prepare aspiring stars for everything that comes with the package of being a pro athlete. It doesn't seem terribly frequent that you come across a non-fiction writer whose books cover a broad range of subjects... well. Berkeley, California resident Michael Lewis shows himself to be the exception to this norm with three excellent books about the widely disparate subjects of baseball team building, technology company creating and football star blooming. His most well-known book in the San Francisco Bay Area has to be "Moneyball" that Lewis wrote as a chronicle of Oakland A's General Manager Billy Beane and his (highly successful) efforts to build a winning baseball team while spending less money than the opposition. To this end, Beane focused (and continues to focus) on trying to exploit untapped market opportunities (i.e. to draft the best college players if other teams are primarily going after only high-school athletes). With it's roots still in Northern California, Lewis also wrote "The New New Thing" about Silicon Valley legend Jim Clark. It's an extremely interesting subject to take on as Clark is currently the only person to create 3 different companies (Netscape, Healtheon and Silicon Graphics) that each reached over $1 billion in value. Clark's former hire at Netscape, Marc Andreesen may be the closest to joining him with his past success at Netscape and Loudcloud/Opsware and current effort at Ning, but for now Clark stands alone in this "$3B club". Lewis' most recent book goes after something entirely different, both in terms of subject and geography. "The Blind Side" is an account of current college football star lineman Michael Oher who went from a poor neighborhood in Memphis, TN to a likely first-round NFL draft pick in the Summer of 2009. Oher's is a fascinating human tale about someone with raw physical abilities and the help then provided to help him reach this current status of potential millionaire. In addition to these excellent books, Lewis also has published a series of pieces for Slate Magazine titled "Dad Again" which chronicle various stages in the births and lives of his three young children with former MTV VJ wife, Tabitha Soren. Headlining these was a fairly large piece titled "Cleaning Solution" about the Sierra Club (America's oldest and largest environmental organization) allowing it's logo to be featured on Clorox Corporation's new line of "Green Works" cleaning products in exchange for undisclosed sums of money. While it's understandable that the Sierra Club would want to maximize revenue (and likely will put said funds to good use), many Club members are raising the question of whether they should be in the product of co-labeling on for-profit products. Additionally, many are concerned about the particulars of this deal (such as what's received by the Sierra Club and how "green" is the "Green Works" line). - Update on awards conferred on writer Charles Fishman's 2007 Fast Company expose "Message in a Bottle" on the bottled water industry. This was particularly interesting coupled with a previous post made here about the impact of a Nestle Corp/Arrowhead brand bottled water plant in rural Northern California. Yep, water is good for you... bottled water, maybe not so much. - Update on former Sierra Club president Adam Werbach who caught a large of "green flak" for consulting with Wal-Mart as chronicled in the 2007 Fast Company piece "Working with the Enemy". Werbach has since sold his consulting company to Advertising giant Saatchi & Saatchi where he'll ostensibly ontinue his environmental efforts... while at the same time defending himself about fellow enviros who feel that he has "sold out" to corporate interests. - "Forces of Nature" about the newly rebuilt California Academy of Sciences in the Golden Gate Park area of San Francisco opening Sept 27, 2008. - Former Microsoft (and now everywhere tech) blogger Robert Scoble and his "Sky Fighters" piece about competing telescope's available on the web... MS's WorldWide Telescope and Google Sky. - Article on the popular travel site Kayak. In his book "The Art of Racing in the Rain", Seattle author Garth Stein weaves a fantastic tale narrated through the inner voice of a dog as he observes the life challenges faced by his intrepid owner. Through this looking in on family heartbreak and challenge, the dog/narrator provides insightful life lessons that in many ways... only a dog could. While this is probably not a book that will resonate with all, it's lyrical and deep in meaning nature is sure to appeal to many... particularly those who love both wisdom and dogs. There are a great number of financial sages to be found in print and one of those with an extremely long track record of solid investment wisdom is Peter Bernstein, author of "Against the Gods: The Remarkable Story of Risk" among other books. I first came across Bernstein in a 2004 Money Magazine interview which led me to read the aforementioned title. This last concept around not simply attempting to "maximize returns" struck me the most in that it means you never will know the absolute highest point an investment will reach, so you never attempt to simply maximize, you always balance against risk. After great anticipation of the event, the opening ceremonies of the Beijing Summer Olympics were in a word... breathtaking. This probably shouldn't be surprising given the government support of these games (to the tune of a reported $300 million USD on the production), but the actual event itself was truly spectacular. - CNNSI: Beijing Games Opening Ceremonies Photo Slide Show... also the source of the images below. - Yahoo! 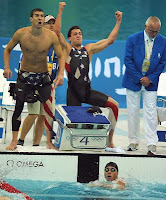 Sports: "Opening Ceremonies Memorable Moments" commentary by Charles Robinson. 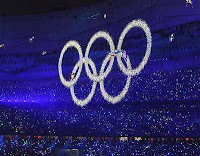 - NBC Sports: "Opening Ceremony in Review" video. Additional NBC video can be found by browsing the NBC Olympics video site. - CNNSI: "China's Spectacular Show" slide show with accompanying audio commentary. In his book "A Few Seconds of Panic", Wall Street Journal writer Stefan Fatsis gives an extremely interesting account of his training camp spent as a 43-year-old journalist going through Training Camp with the Denver Broncos as a field goal kicker. The journey he took was reminisent of George Plimpton's decades ago when he went through Camp with the Detroit Lions as part of his book "Paper Lion". While the book dragged on at times, I still highly recommend it to anyone who is a fan of the NFL as it gives a detailed look at what life in the league can be like for the players... a very few of whom are the stars and majority are often expendable parts. I've for quite a while found fascinating the fact that the NFL is the major league you're most likely to suffer a dehibilitating injury in, and the only one that doesn't have fully guaranteed contracts. This view I've had of it as a "chew 'em up and spit 'em out" league is reinforced throughout Fatsis' book... particularly in the several sections where he talks about players going through camp knowing they won't make the team and the coaches knowing they won't make the team, but being kept around to the end to "keep other teams from getting them... you know, just in case someone gets hurt." There's also a terribly interesting observation made in the middle of the book that the league is broken down into two types of players... not by age, race or salary, but by respective love of the game. There's one camp of players that still just love the game and accept that the parts of being a pro athelete they don't like just come with the territory. The other camp probably also started out loving football (as I imagine most college players still do), but now continue on with NFL careers for the money (understandable given how high the salaries can get), and in spite of the berating of coaches and potential for life-impacting injury. All in all... really good read. Whereas the last post was about a process of writing (specifically writing while holding a different job), I thought it would be interesting to pull together some different stories about... "the big guns", those writers who certainly may have had held down day jobs while writing, but certainly don't have to now. Additionally, these are all authors I've had the chance to read and form an opinion on. Starting off at the very top is of course, J.K. Rowling who was featured as a "Person of the Year Runner-Up" in the Dec 31, 2007-Jan 7, 2008 issue of Time Magazine. Having been a devoted reader of the entire Harry Potter series, I completely agree with the accolades received by Rowling... and shared her view of the last book (below) as being the best. Following on the heels of Rowling is Stephenie Meyer. In an Apr 2008 piece titled "Stephenie Meyer: A New J.K. Rowling?" Time profiled the author of the Twilight series. Being curious to see what all the hulabaloo was about, I read Meyer's first book "Twilight" (which became so popular that it became the first in a series) and can attest that it's very entertaining writing and that yep... I'm looking forward to the movie. Moving on from the teen fantasy genre, Time in Oct 2006 gave a profile of John Grisham which went into detail about his non-fiction book "The Innocent Man". A fascinating read that made me never want to grow up in small-town Oklahoma. And finally... having gone through the progression of authors I find brilliant (Rowling) to very good with potential for brillance (Meyer & Grisham), there's James Patterson. In March of 2006 Time had "The Man Who Can't Miss" on the gazillion copy selling writer, but having read one of his books... I just don't get it, but with 100 million readers (even better for Patterson, 100 million copy purchasers), he's doing something right. Whatever, there's is reason to believe it can be done, and well. The May 2006 issue of Fast Company Magazine contains "Join the Corporate Literati" about people who have succeeded (and continue to) at this dual effort. Another story from Fast Company in Jan 2006, "In Good Company" is about Australian author Max Barry who wrote his first novel during lunch breaks away from Hewlett-Packard. There are of course many ways to skin a cat, but in Barry's case, he utilized the Internet Writers Workshop to improve his craft. I can attest that Barry's most recently published book, "Company" was an excellent read with a very funny (of the biting humor variety) look at Corporate America and it's follies. So, all this being said, the point of the story is is someone wants to write, they will. It may be tough and may require disciple, but it can be done. That's encouraging.